Whether you want to create newsletters or classroom posters, the possibilities are truly endless. Just about a month ago I led a special webinar for teachers all about Adobe Spark. Now typically when I share this powerful, open-ended creation tool, I focus on ways to turn students into creators. Not this time. This webinar was all about the wonderful things teachers can do with the Spark tools. In this blog post, I share highlights from the webinar (see more upcoming events here) so you can pick and choose which teacher projects to explore. Whether you want to create newsletters or classroom posters, the possibilities are truly endless. The three Adobe Spark tools make it possible for teachers to create websites, movies, and graphics from any device. So if you have access to a web browser or want to download the free app on your iPhone or iPad, you’ll be totally set. 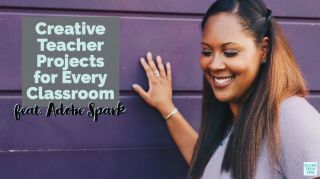 Check out my book with Ben Forta, 40 Ways to Inject Creativity in the Classroom with Adobe Spark for more ideas on using Adobe Spark in your classroom! You can leverage the power of EdTech tools like Adobe Spark to create lots of items for your classroom. Although I highlight four favorite teacher projects in the list below, don’t let my ideas limit you. A monthly classroom newsletter is a great way to stay in touch and communicate information with families. You might share a bunch of snapshots from a field trip or special event from the month. A newsletter is a great way to showcase all of the wonderful things that have happened in the weeks before the newsletter goes out. In addition to focusing on special events or a recap of the month, a newsletter can also include a call to action. Use the “button” feature in Spark Page to encourage families to fill out a Google Form to sign up to volunteer for an event. Additionally, you can add video links to your Page to share resources with families to help them have content-rich conversations with their children at home. You don’t need a camcorder or a fancy camera to make a great class movie. Spark Video is a fantastic tool that lets users combine images to form a slideshow. Although you also have the option to add video clips to your movie, I love how Spark Video makes it easy to combine images. So if you took a lot of snapshots from a field trip this year, bring them all together with a Spark Video. If you have families that speak multiple languages at home, you can actually duplicate the movie project by clicking on the duplicate button on your Projects screen – subscribe to my YouTube channel or sign up for my newsletter to get notified when this tutorial goes live. From flyers in a student folder to announcements posted online, a Spark Post creation is perfect for sharing. With Spark Post, you can make graphics in any size. You might use this tool for classroom posters, to share instructions with students, highlighting new strategies, or even sharing an inspiring quote like the one below. There is now the option to download your Spark Post as a PDF too. This new option especially makes Post an excellent tool for creating classroom posters, flyers, and any time of paper or digital communication with families. If you haven’t tried Post yet, make sure to check out the option to add icons to your creation. With the icon feature, you can choose symbols that grab the attention of readers and direct them to more information. In this blog post I discuss why I love to use icons in Spark Video too. Keeping track of your growth as a professional and chronicling your success stories from the school year can seem like an overwhelming task. An online space to capture your professional accomplishments gives you the opportunity to add text, images, and links all in one place. All you have to do is start a new Spark Page, and then you can organize your content and feature any updates as the school year progresses. One thing I love about Spark Page is how easy it is to update the link to the published page after you’ve made a few edits. As you can see in the picture above, when you make changes to your Page all you have to do is press the Publish button again, and you’ll have the option to update the link. This option lets you share one link when you first get started with your Spark Page professional page, and not have to worry about replacing the link when you add updates throughout the school year. Now of course I love the Adobe Spark tools for student creations – Ben Forta and I wrote a whole book about it! But for teacher projects like the ones mentioned above, Spark is certainly a standout. So many teachers tag me on social media (@classtechtips) when they share their Spark creations – I can’t wait to see what you make too. Head over to Adobe Spark’s website to get started with one of these teacher projects!